When you're cooking, you're a chemist! Every time you follow or modify a recipe you are experimenting with acids and bases, emulsions and suspensions, gels and foams. In your kitchen you denature proteins, crystallize compounds, react enzymes with substrates, and nurture desired microbial life while suppressing harmful microbes. And unlike in a laboratory, you can eat your experiments to verify your hypotheses. 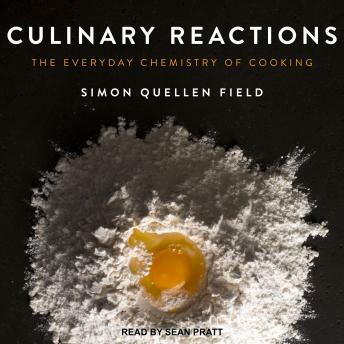 In Culinary Reactions, author Simon Quellen Field explores the chemistry behind the recipes you follow every day. How does altering the ratio of flour, sugar, yeast, salt, butter, and water affect how high bread rises? Why is whipped cream made with nitrous oxide rather than the more common carbon dioxide? And why does Hollandaise sauce fall for 'clarified' butter? This easy-to-follow primer even includes recipes to demonstrate the concepts being discussed, including Whipped Creamsicle Topping (a foam), Cherry Dream Cheese (a protein gel), and Lemonade with Chameleon Eggs (an acid indicator). It even shows you how to extract DNA from a Halloween pumpkin. You'll never look at your graduated cylinders, Bunsen burners, and beakers the same way again.